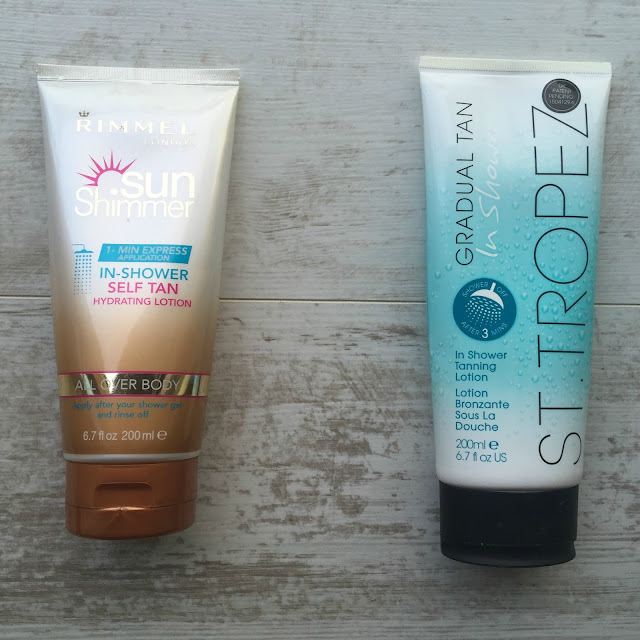 You might recall last year I reviewed the St Tropez In Shower Gradual Tan on this blog - and despite my reservations about applying a tanning product in the shower - I really liked and rated it. You can read my detailed review here to jog your memories. I was browsing in a pharmacy in Newry a few weeks back and I spied the new Rimmel Sunshimmer In-Shower Self Tan, and given my overwhelmingly positive experience of the St Tropez tan, and to appease my curiosity, I picked up a bottle to trial. I've been using it consistently since - 6 applications over the course of 12 days and I feel sufficiently well versed to let you know what I think of it now. Rimmel claim on the bottle that this In Shower Self Tan is to applied in the shower directly after your shower gel, leave for one minute and then rinse off. When you get out of the shower, you're warned to "dry yourself without rubbing and dress-up". What immediately struck me about this tan compared to the St Tropez version is that whilst you are expected to stand around in the shower for 3 minutes after applying the St Tropez tan, 1 minute is sufficient for the Rimmel version. 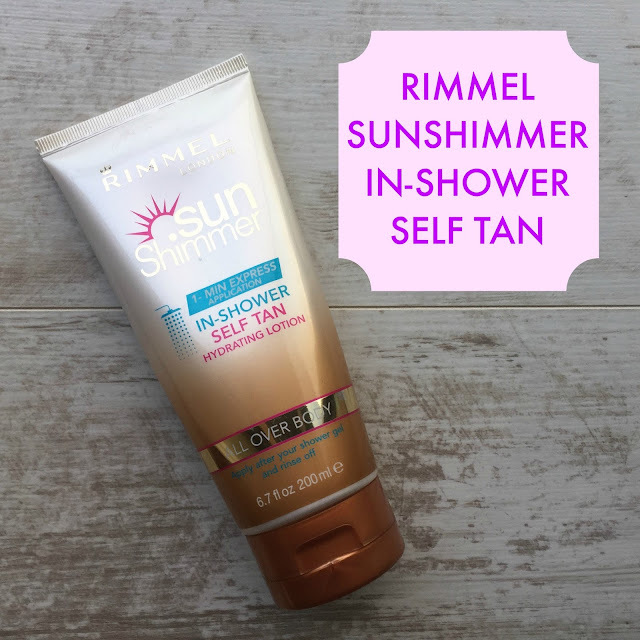 I hoped that the Rimmel In-Shower tan would be the drugstore/high street equivalent of the St Tropez tan - it's not. I followed the instructions to the letter - I thoroughly exfoliated using Cocoa Brown Tough Stuff before I used my shower gel as per normal and rinsed off. I was as smooth and clean as I could have been before my first application. I turned off the water in the shower, applied a splodge of the light brown product onto the palm of my hand and applied it on to my skin. There is no colour guide but the product is quite thick so I think it was pretty easy to know where you were applying it and to avoid any patches. On my first application I also applied this to my face. I duly waited my 1 minute and rinsed off, but my biggest bugbear with this product, my skin was covered in a thick oily residue. I didn't want to scrub the residue off, but getting out of the shower and patting myself dry, I absolutely detested how greasy and oily my skin felt. I never experienced this with the St Tropez tan. I patted myself dry but my skin still felt too oily for clothes so I had to wait considerably longer than I would have wanted to be able to get dressed. Each subsequent time I used it, my skin had that horrific residue. There really is nothing worse than getting out of the shower in this humid, hot weather feeling even stickier than you did before you got into the shower. I didn't miss any patches when applying this product because even though there is no colour guide, the product is quite thick that it's easy to see where you applied it. On the very first application, that horrific biscuity tan developing smell starting kicking in almost immediately, and got progressively stronger as the hours passed and continued to stink - it was sickening. I didn't quite cop that whilst the St Tropez In Shower Tan markets itself as a gradual tan, the Rimmel equivalent markets itself as an in-shower self tan'. 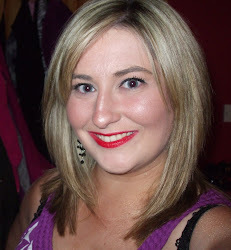 The colour from the Rimmel tan definitely came up a lot stronger than the St Tropez tan from the very first use. If you want quick tan colour payoff, then go for the Rimmel tan, if you prefer a more gradual build up of colour, then go for the St Tropez tan. As for the colour itself - FAR too orange for my liking. I liked the shade and depth of the St Tropez one even when I built it up fully but the Rimmel one has an air of L'Oreal Sublime Bronze (read Sublime Orange) to it and I'm not so keen. I have really dark patches on my elbows despite prior exfoliation and constantly moisturising them. I haven't applied the tan in my last three showers and I still cannot get the brown patches off - my elbows are nearly raw from the scrubbing. The tan did not apply evenly on my legs despite a thorough application. It also left me with orange palms, darker skin between my fingers and this was after thoroughly washing my hands after applying the product. Terrible. Looks okayish on the first day but wears absolutely terribly. It rubbed off on leggings, rubbed off on my socks and tops. The usual wear spots were highlighted - hands, inside arms - the colour didn't fade but looked muddy and dirty. The worst was my neck -I had to scrub my neck clean because the tan just looked horrific on my neck on the second day. If you want tan that looks average for a day and like dirt the day after, look no further. 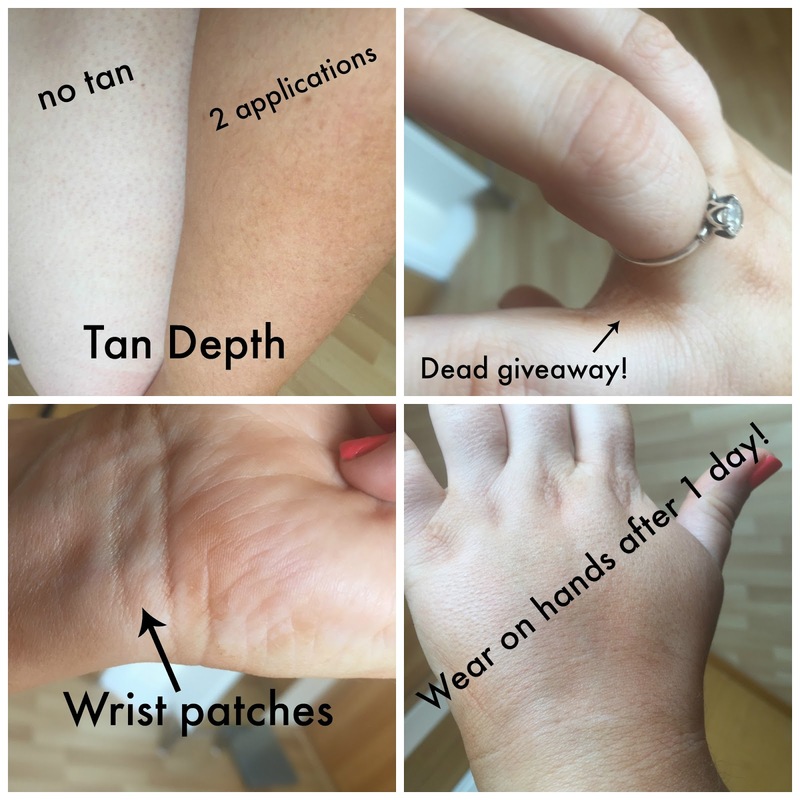 It's also REALLY hard to scrub off your skin - I've gone through a bottle of my beloved Cocoa Brown Tough Stuff this week and, like I said already, my skin is sore from rubbing it raw trying to remove the leftover tan patches. I paid £7.99 for this (about €11) but I've seen it for sale on the Boots website for €13.99. The St Tropez tan in comparison is €19.99 for the exact same size bottle. I much MUCH prefer the St Tropez version and I will definitely not repurchase the Rimmel In Shower Tan - no way Jose. It's disgusting to apply and lasts terribly, it stinks and is hard to scrub off. I cannot tell you what to do with your moolah but I would strongly advise you not to waste it on this Sunshimmer In-Shower Self Tan. I've moved on to bigger and better tans already! Have you tried this new In-Shower tan or would you be tempted to try it? What's your go to fake tan? I was actually tempted to try this when I saw it was out.. But me and my friend were talking and wondered how it would apply without applying streaky! Think I'll steer clear after your review.. I love the Rimmel Sunshimmer Mousse though, it's my absolute favourite fake tan, it's the only tan that I find actually applies nice on me! Oh dear. Disappointing - Rimmel is really a bit hit and miss I find. I suppose you get what you pay for in this case! I wish I had read this before I tried it! I've returned from 2 weeks in Turkey with a half decent tan but wanted to keep it topped up. I applied this yesterday and experienced that same oily sticky feeling and last night noticed the terrible streaks everywhere. How can I get it off? !